I’ve been using the VaporFi VEX 150 TC for about 3 months, the longest trial period Seven Report has ever subjected a product to prior to publishing an in-depth review. VaporFi offers three distinct families of mods, the VOX, VAIO and VEX. The VEX 150 TC is the most powerful of all the mods they offer. Seven Report has published reviews on quite a few VaporFi mods, and with each new mod they somehow manage to maintain or even increase the quality level. The VEX 150 TC continues that tradition. The VaporFi VEX 150 TC will fire coils with a resistance range of 0.1 – 3.5 ohm in wattage mode and 0.05 – 1.5 ohm in temperature control mode. The wattage range on the VEX 150 TC is 1 – 150 watts with adjustments in 0.1 watt increments. In temperature control mode the range is 200° F – 600° F in 10° increments and 100° C – 315° C in 5° increments. In temperature control mode the VEX 150 TC will fire Nickel 200, Titanium or Stainless Steel coils. Two external 18650 batteries (not included) power the VEX 150 TC. 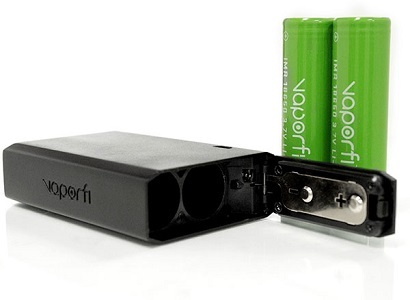 The battery door has a spring loaded latch, VaporFi refers to it as “bottom door slip.” Positive and negative signs are etched into the door to make it obvious which way to insert the batteries. You can charge the batteries while they’re still in the device via the micro USB port on the side of the mod and the included charging cable. And you can continue to vape while charging, though it will slow down the charging process. To turn the mod on or off click the fire button five times. The VEX 150 TC has a crisp, large (0.96”) OLED display that shows temperature or wattage (depending on which mode you’re in and the mode will be displayed above power or temp reading), voltage, coil resistance, amps and a dual battery meter. 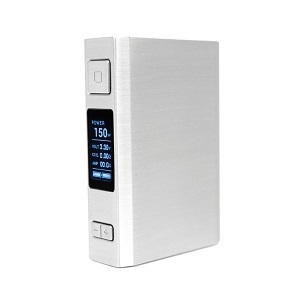 You can change the amp reading to display a puff counter or cumulative vape timer in the menu system. To enter the menu system press the fire button quickly three times. You’ll know you’ve successfully entered the menu when the mode begins to flash. 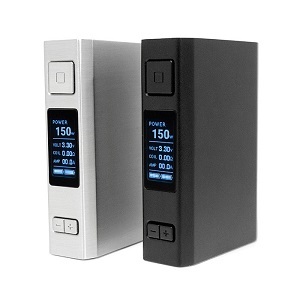 Press the “+” button to switch between wattage, temperature and the TCR 120 sub menus. To choose your coil material in temperature control, enter that sub menu, then click the “-” button and the coil type will begin to flash. Press the “+” button to cycle between NI, TI and SS316. When you’ve highlighted your desired coil material press the “-” button again and the max wattage setting will begin to flash. Use the adjustment buttons to set it. Press the “-” button again highlight the resistance setting. Press the “+” button to lock the base resistance of the coil. You should do this with the coil at room temperature. Press the “-” button one more time to highlight the amp display. When that starts to flash press the “+” button to change that display to the puff counter or cumulative vape timer. The next sub menu is the TCR 120 memory setting menu, with three presets M1, M2 and M3. This functions the same way as the temperature control menu as far as settings. The final sub menu sets the VEX TC 150 to power mode. In this menu the only adjustment you can make is to that bottom line of the display. Once you’ve selected your mode and if necessary coil material, you can adjust wattage or temperature with the “-” and “+” buttons. The VEX 150 is smart enough to recognize a Kanthal coil so that even if you’ve set the mod to temperature control, if you have a Kanthal coil attached it will default back to variable wattage mode. The wattage range on the VaporFi VEX 150 TC is 1 – 150 watts with adjustments in 0.1 watt increments. In temperature control mode the range is 200° F – 600° F in 10° increments and 100° C – 315° C in 5° increments. You can lock the adjustments by pressing on both of the adjustment buttons at the same. The display will read “Key Lock.” Unlock it the same way. Enter and exit stealth mode by pressing both the “-” and fire buttons. To check your settings in stealth mode quickly click the fire button. While vaping the volt reading will switch to a timer. I’ve used and reviewed quite a few VaporFi mods and they have all performed excellently. The VEX 150 TC performs as well or better than any of them, and that is saying a good deal. No matter the tank I’ve attached to it, the VEX 150 TC has fired it flawlessly. I’ve used it in both temperature control and wattage modes. This device works well with them all. The most obvious positive feature of the VEX 150 TC is its top end wattage output of 150 watts, the most powerful of any VaporFi device to date. But the features don’t stop there. The VEX 150 TC is not only the most powerful but also the most feature rich mod in the VaporFi line up. It will fire Nickel 200, Titanium and Stainless Steel coils in temperature control. The VaporFi VEX 150 TC has a robust menu system that allows you to really customize the performance of the device. And that huge display is sharp and easy to read. All of the standard safety features are here; reverse polarity, over-discharge, over-charging and over-current protections. The only minor negative is one that is really more of a personal pet peeve of mine. That’s the increment of change in temperature control, 10° in Fahrenheit and 5° in Celsius. I much prefer single degree increments. VaporFi has built a reputation for high quality devices and that may be the strongest characteristic of the VEX 150 TC. This is a solid, high functioning mod. The brushed Zinc Alloy body is heavy duty. All of the buttons function flawlessly. And that large display is bright, crisp and easy to read. This is a very attractive mod. That Zinc Alloy has a brushed finish that is quite distinguished. Its width gives it a very solid substantial look and feel. And the display is one of the best looking I’ve seen. If there’s one area where VaporFi takes a little heat it’s in the price department. They list the VEX 150 TC at $129.99. That is not an outrageous price. And when you consider the quality, features and performance of this device it’s actually very reasonable. Add to all of that VaporFi’s industry leading 30-day money back guarantee and 90-day warranty and the VEX 150 TC is a solid deal. I’ve subjected the VaporFi VEX 150 TC to the most grueling testing of any device reviewed by Seven Report, using it extensively for 3 months with a wide variety of tanks and in both temperature control and variable wattage modes. It has not let me down in the least and continues to perform as well as it did right out of the box. This has become my default every day device. It feels great in my hand, looks good and fires every time I hit the button. The VaporFi VEX 150 TC should meet the needs of even the most discriminating vaper. 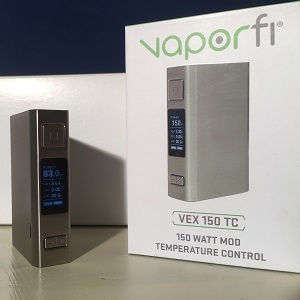 VaporFi provided the VEX 150 TC Mod for the purpose of this review. VaporFi is a Seven Report advertiser. Order the VEX 150 TC from VaporFi.